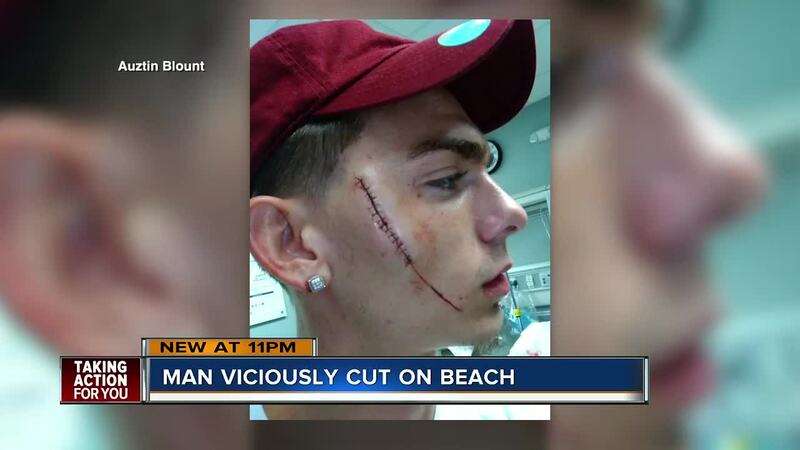 CLEARWATER, Fla. — Clearwater Beach, one of the most popular tourist beaches in Florida, was the scene of a vicious attack on Sunday night. Police say that a local man was stabbed and slashed with a box cutter in front of children on the boardwalk. Sunday night, Blount said he was enjoying a nice evening out with his girlfriend and another friend. He was sitting on the seawall just down from Pier 60 when he said a woman, who Clearwater police later identified as Kristi Kauffmann, approached him. In a split second, Blount said Kauffmann became enraged. Blount said Kauffmann started arguing with his girlfriend. Blount, covered in blood, ran after Kauffmann. As they both ran through a crowded boardwalk Blount saw a Clearwater officer standing on Pier 60. “I hollered at him I said, ‘hey officer this woman just stabbed me in the face’ and the officer ran after her and caught her,” Blount said. Kauffmann is a convicted felon that spent nearly six years in prison for Aggravated Battery with a deadly weapon. She was released from prison in 2013 according to inmate records. Pinellas County records show Kauffmann was arrested less than two weeks before Blount was stabbed for simple battery. Blount can’t believe this all happened on Clearwater Beach. Blount has a newborn baby boy and a 14-month-old son. He doesn’t have health insurance. “They said it was going to be a couple thousand dollars for the stitches and everything. So, this is going to be a big burden on me,” Blount said. If you want to help Blount’s family click here. Kauffmann remains in the Pinellas County jail facing multiple felony charges.